October! King, Marlin, Dolphin, This, That! NOAA Fisheries requests your comments on a proposed rule for golden tilefish. The proposed actions would reduce golden tilefish catch limits based on the most recent population assessment. The purpose of the action is to end overfishing (rate of removal is too high) of golden tilefish in the South Atlantic. The proposed rule would set the total catch limit at 342,000 pounds gutted weight (lbs gw). This proposed rule would also specify the commercial and recreational sector catch limits and component commercial quotas using the existing sector allocations. The commercial catch limit would be 331,740 lbs gw. The commercial quota for the hook-and-line component would be 82,935 lbs gw, and the commercial quota for the longline component would be 248,805 lbs gw. The recreational catch limit would be 2,316 fish. The 15 day comment period associated with this proposed rule will end on October 12, 2018. We will address all comments specifically directed to the proposed rule in the final rule. You may submit comments by electronic submission or by postal mail. Comments sent by any other method (such as e-mail), to any other address or individual, or received after the end of the comment period, may not be considered by NOAA Fisheries. 2. Click the “Comment Now!” icon, complete the required fields. Why is the reduction in the catch limit being proposed? In April 2016, a population assessment update for golden tilefish was completed using data through 2014 (SEDAR 25 Update 2016). 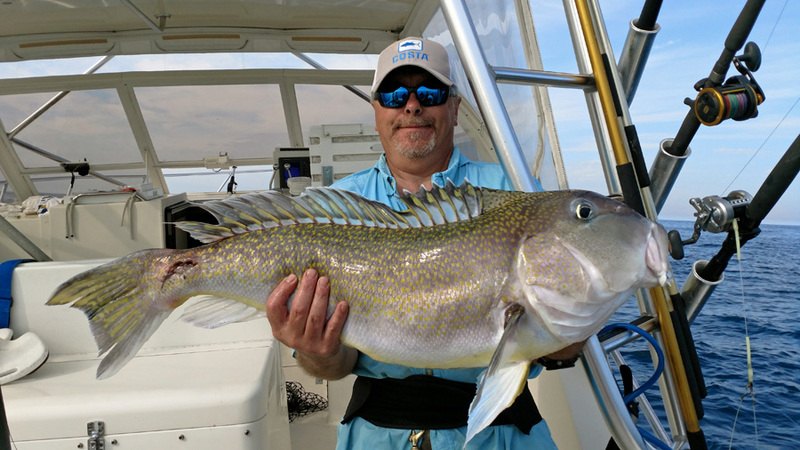 The update assessment indicated that the golden tilefish population is undergoing overfishing but is not overfished (population abundance is too low). As mandated by the Magnuson-Stevens Fishery Conservation and Management Act, the South Atlantic Fishery Management Council and NOAA Fisheries must end overfishing of golden tilefish. The proposed rule for Amendment 28 to the Fishery Management Plan for the Snapper-Grouper Fishery of the South Atlantic Region reduces the catch limit based on the most recent assessment to end overfishing of golden tilefish. An interim rule, which temporarily reduced overfishing of golden tilefish, expires on January 3, 2019. This proposed rule would replace the interim measures. What are the actions in the proposed rule? Revise the commercial and recreational catch limits for golden tilefish in the South Atlantic (See Table 1 below). Table 1. Proposed commercial and recreational catch limits for golden tilefish. Where can I find more information on the environmental assessment and the proposed rule? The environmental assessment and proposed rule may be found online at the NOAA Fisheries Southeast Regional Office Web site at: https://www.fisheries.noaa.gov/action/regulatory-amendment-28-golden-tilefish-annual-catch-limits.